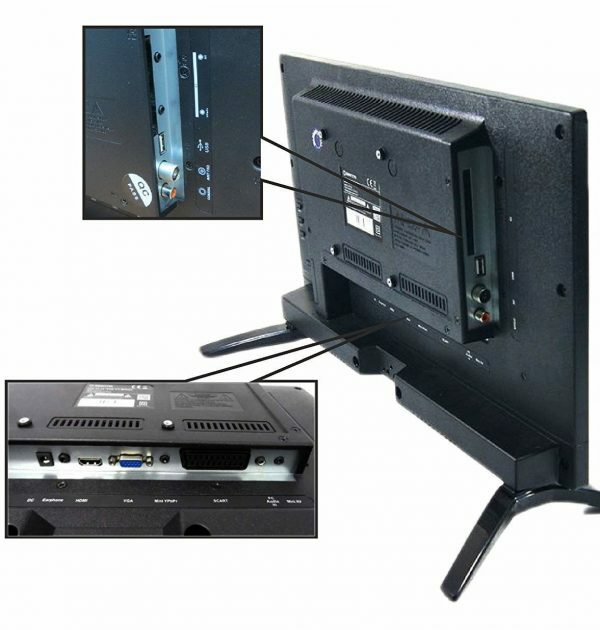 The 20LHN38L TV is equipped with a VGA socket and PC Audio inputs. Thanks to this, it can successfully replace a computer monitor. This solution is ideal for small rooms, for example a children’s room, where there is no place for both the monitor and the TV. The short reaction time and excellent colour saturation make the 20LHN38L work well in both functions. 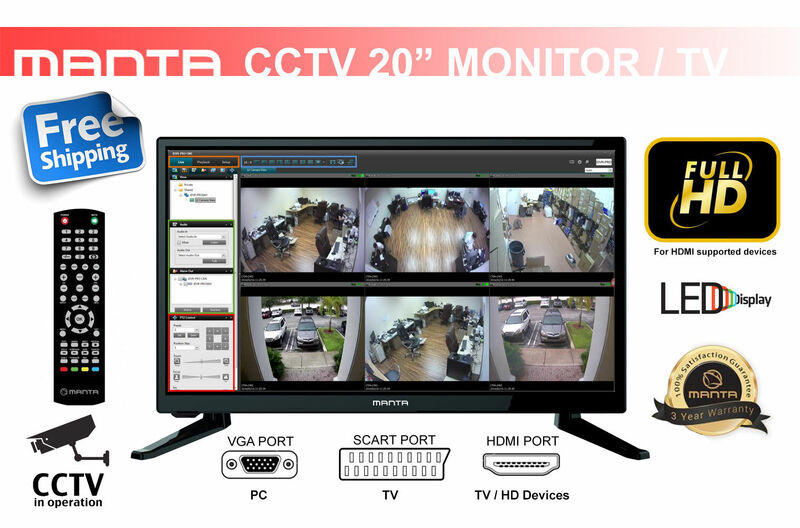 We personally own one of these for our security CCTV device and works perfect! a VGA input is very hard to find on most 20″ TVs and this does wonders, switch from the VGA function to the Freeview with no hassle. 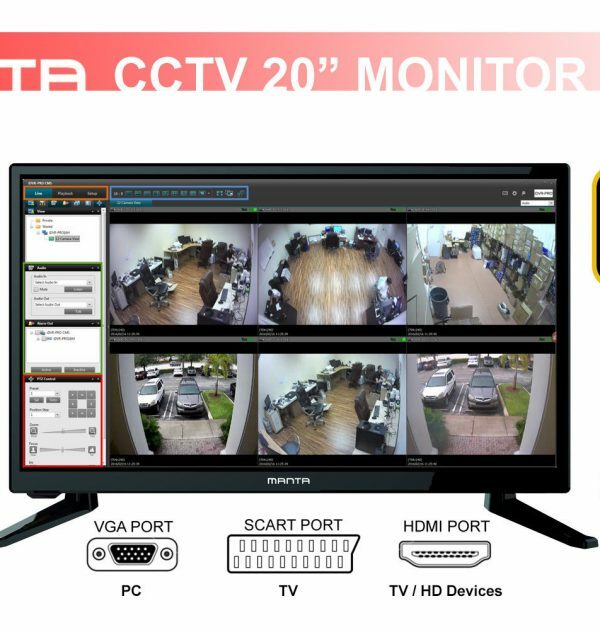 MOST CCTV SYSTEMS WORK EITHER HDMI or VGA THIS HAS BOTH! 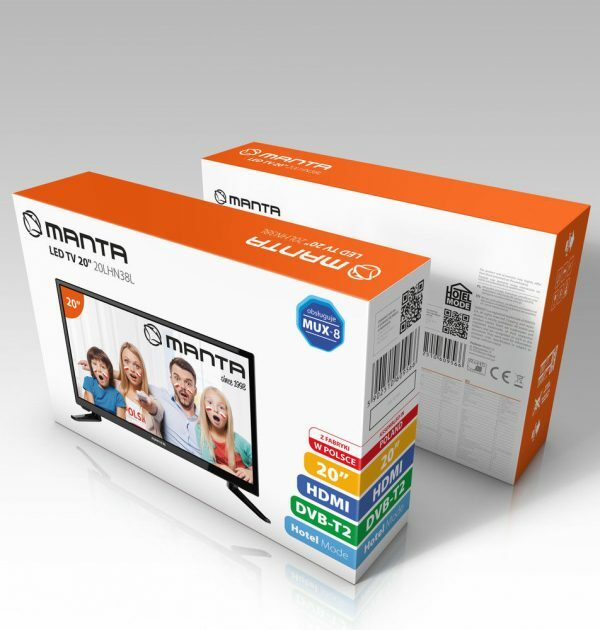 Manta 20LHN38L is a small TV with a 20-inch diagonal, which is perfect for children’s or teenagers. 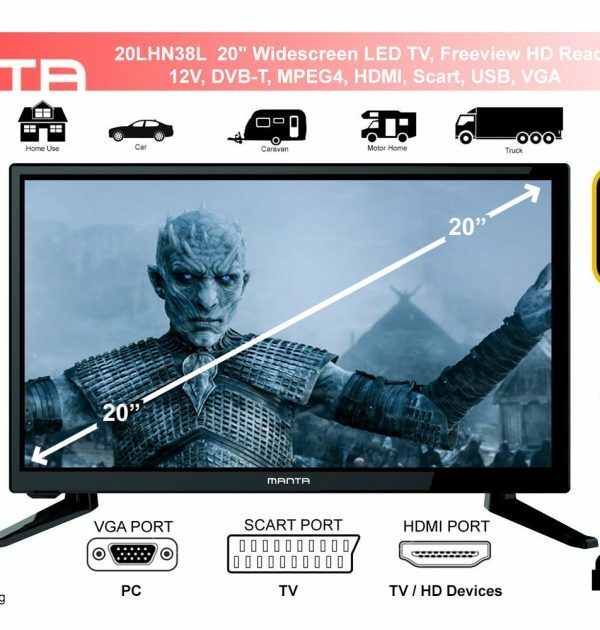 The HD READY resolution offered by this TV is typical for devices with a 20-inch diagonal. The TV is equipped with a DVB-C / T2 tuner and allows you to receive terrestrial digital television and cable television. Thanks to the HDMI connection it is possible to connect, for example, a DVD player or game console. The TV is equipped with a USB port, thanks to which it is possible to play multimedia from pendrive removable media. The PVR function allows you to record TV programs on removable media. The Electronic Program Guide (EPG) allows you to conveniently display information about the currently displayed program and other broadcast programs. It also allows for temporary recording programming. 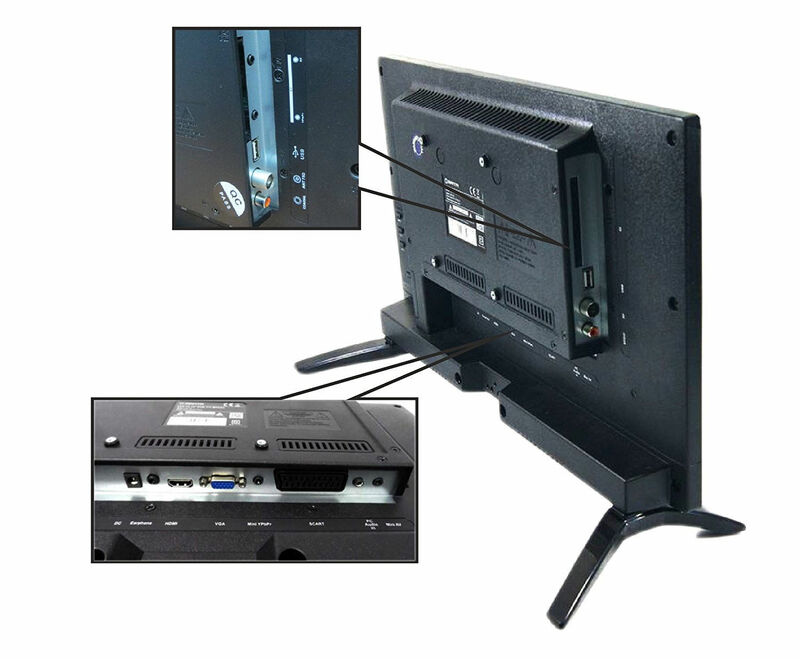 After connecting a pendrive or a portable hard disk with the appropriate content through a USB connector built into the TV, the user is able to play multimedia content of the media. The receiver supports popular movie formats – also in HD resolution. There is no lack of possibilities to view photos stored in digital format on your TV screen, and you can also play music files. The TV also allows you to record programs by storing data on the USB device connected to the TV. The device also works great with teletext viewing. 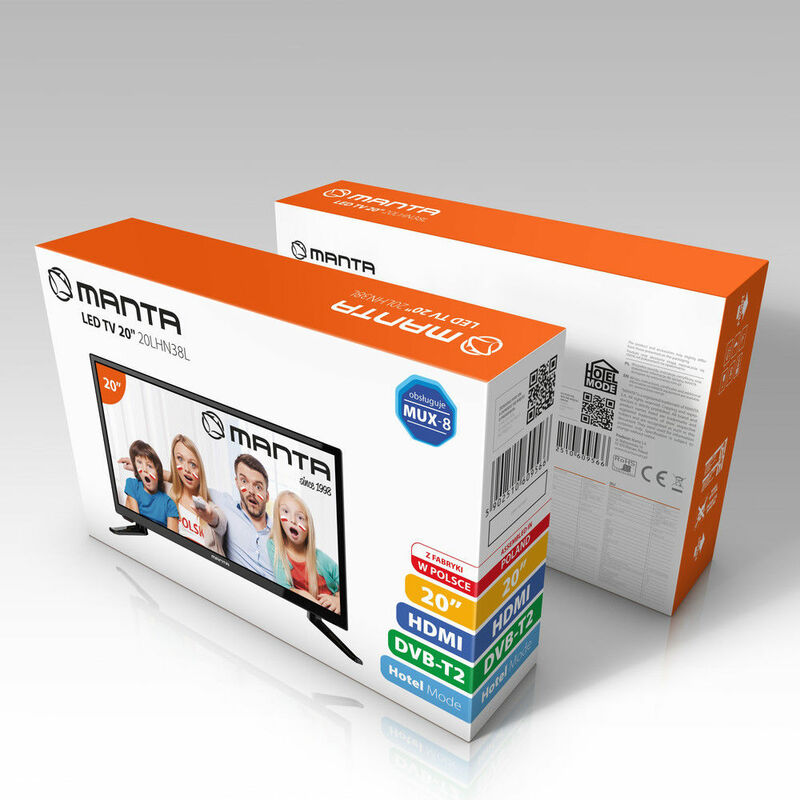 Formatted product description Manta 20LHN38L is a small TV with a 20-inch diagonal, which is perfect for children’s or teenagers. 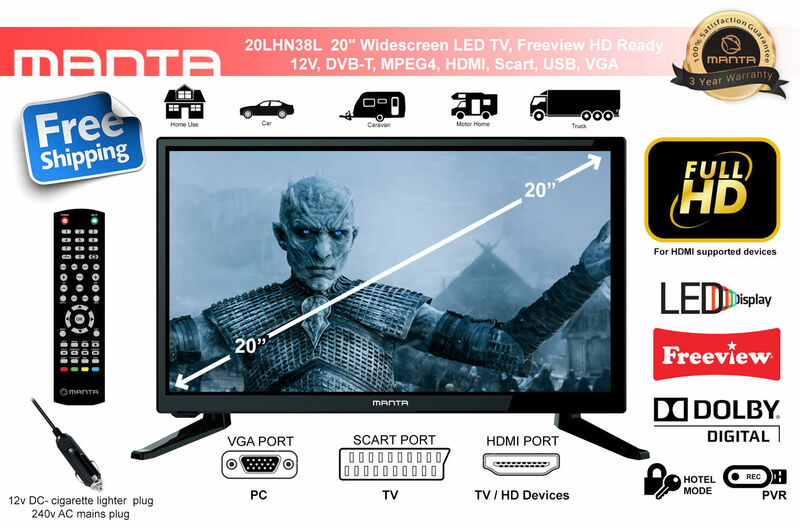 The HD READY resolution offered by this TV is typical for devices with a 20-inch diagonal. The TV is equipped with a DVB-C / T2 tuner and allows you to receive terrestrial digital television and cable television. Thanks to the HDMI connection it is possible to connect, for example, a DVD player or game console. The TV is equipped with a USB port, thanks to which it is possible to play multimedia from pendrive removable media. The PVR function allows you to record TV programs on removable media. The Electronic Program Guide (EPG) allows you to conveniently display information about the currently displayed program and other broadcast programs. It also allows for temporary recording programming.20LHN38L instead of the monitor The 20LHN38L is equipped with a VGA socket and PC Audio inputs. Thanks to this, it can successfully replace a computer monitor. This solution is ideal for small rooms, for example a children’s room, where there is no place for both the monitor and the TV. The short reaction time and excellent color saturation make the 20LHN38L work well in both functions. The TV is Also suitable for Motorhomes, Caravans, Boats and HGV trucks as this Television set can also be powered by 12 volts. USB media Playback. 12 V DC input. With 16:9 Aspect Ratio (1366×768 Resolution). 12V Car adapter lead cigarette lighter plug included. Connectivity: 1 x HDMI, 1 x USB, 1 x Coaxial, 1 x Y/PB/R, 1 x VGA, 1 x PC Audio In, 1 x CI/CI+, 1 x SCART, 1 x AV IN, 1 x RF. Power consumption: 17Wh. Approximate Annual Power Consumption: 25kWh (when used for 3 hours a day). For normal 240v usage or for outdoor 12v usage. (Do not use on 24v – only use in truck if you have 12v in truck). THE SOUND WILL NOT WORK ON A 24v TO 12v STEP DOWN CONVERTER – MAKE SURE THE SOURCE IS DIRECTLY 12v. Brand New with 3 Years Manufacturer Warranty. Please use and send the warranty card provided with the instruction manual.